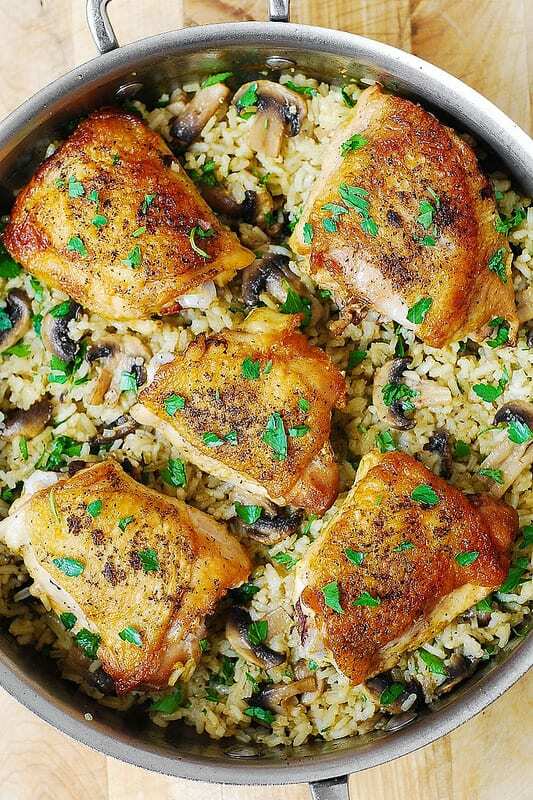 Delicious one-pan Chicken Thighs with Mushroom Rice takes only 40 minutes to make, and it will become one of your favorite ways to eat chicken thighs. Easy to make, the clean up is minimal. 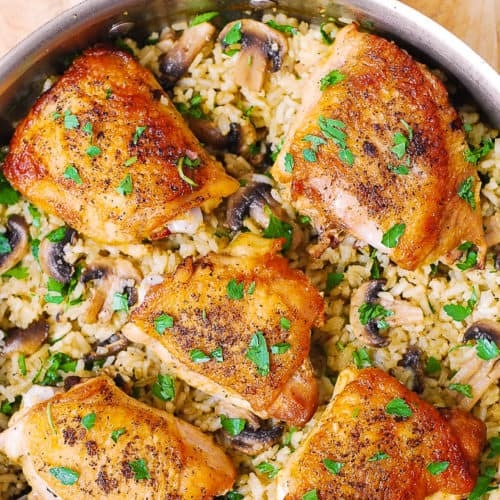 What I love about this recipe is the delicious dark chicken meat on top of a really flavorful mushroom rice! This was so good! The recipe is ridiculously easy to make. First, the skin-on, bone-in chicken thighs are seared in a large skillet to brown the skins. Then, jasmine rice is cooked in chicken broth with sauteed mushrooms, and the chicken thighs are cooked right on top of the rice, releasing their juices into the rice, making it even more flavorful. YUM! 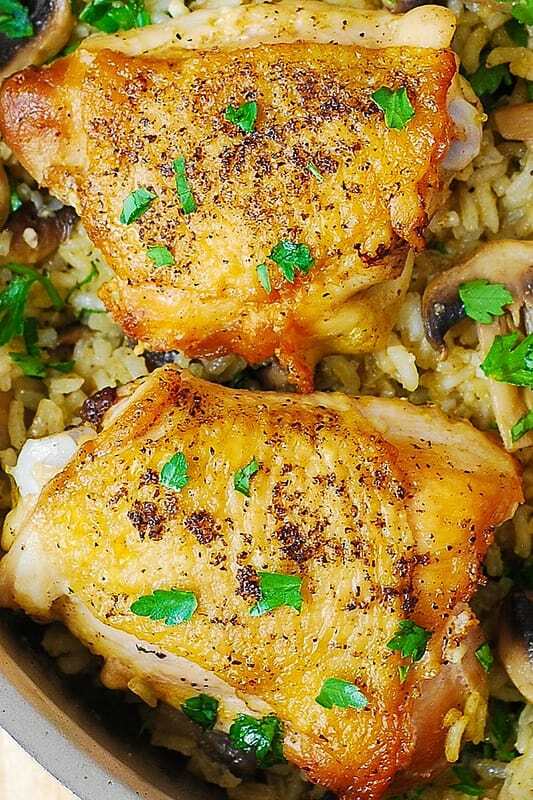 If you’re a fan of chicken thighs and if you like rice, you’ll love this recipe! It’s so easy too: only one pan is used to cook everything together. I used bone-in, skin-on chicken thighs, but you can remove the skins if you like and just proceed with the recipe as is. You can also use skinless, boneless chicken thighs, too. For rice, I recommend Jasmine rice (that’s what I used) or any kind of rice that takes about 2o minutes to cook. Do not use instant rice: you will want to use the rice that cooks for about 20 minutes in chicken broth and with mushrooms mixed in to absorb all the flavors. 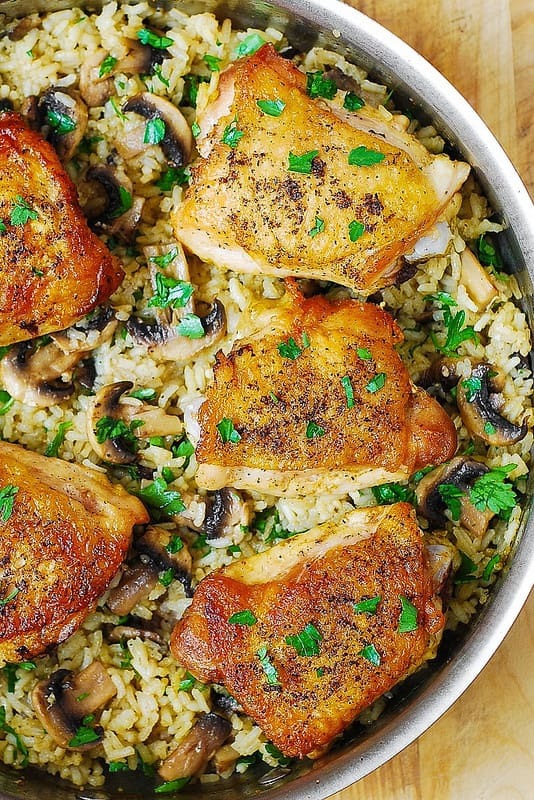 One-pan bone-in, skin-on Chicken Thighs with Mushroom Rice take only 40 minutes to make. Easy to make, the clean up is minimal, only one pan is used - a large skillet. Great recipe to make flavorful rice from scratch along with the chicken. Heat a large skillet on medium-high heat until hot. Add olive oil - it should run easily because the skillet is hot, but not sizzle or smoke. Season skin side of chicken thighs with salt and pepper. Sear them on high-medium heat in the skillet, skin-side down, for 5 minutes, until skins get golden brown color but don't get burned. Skillet should not be burned on the bottom. Flip the chicken thighs to the other side and sear for 2 more minutes on medium heat. Remove the chicken from the skillet (it will not be cooked through - you'll continue cooking it in the next steps). To the same (now empty) skillet, add thinly sliced mushrooms, sprinkle lightly with a pinch of salt, and cook on medium heat for about 1-2 minutes, until mushrooms soften. To the same skillet (with mushrooms), add chicken broth, water, uncooked rice, 1/4 teaspoon salt. Bring to boil. Mix everything well. Put chicken thighs on top, skin-side up, making wells for them in the rice. Reduce the heat to low boil simmer. Cover the skillet with the lid. Simmer for 15-20 minutes, covered, until the rice is cooked through, and the chicken is completely cooked (no longer pink in the center). Remove the chicken from the skillet. Stir the rice really well, taste and season with more salt and pepper if desired. Put chicken thighs back to the skillet. Sprinkle with chopped fresh cilantro or parsley before serving. Loved this recipe! Next time I’ll try it with chicken breasts. Hi I am going to cook this tonight I have a question. Do I use stock pots it mention two cup of chicken stock i’m not sure if I should use both or just one? Use 2 cups of chicken broth or vegetable broth. Add it to the same pan in which you cooked the chicken. Everything is cooked in one pan. This is an easy recipe to double! Either use a bigger pan, or use a pan of a similar size and do 2 batches at the same time.